Why we are getting excited about Google AdWords Ad Variations! 'Test and Measure' is eGenie's mantra. So it comes as no surprise that, whenever Google releases a new update giving us the ability to test and measure, we get excited. Ad Variations are no exception. You can see more ways we test and measure here. Every marketing agency worth their salt will test and measure. Therefore some agencies will blow 80% of the budget in the first phase of a campaign on unsuccessful ads, just to find the winning formula. 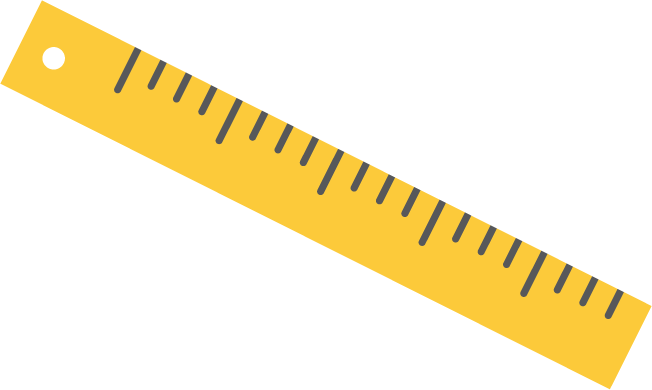 We believe that you should test and measure in every phase of a campaign. That's why we are so excited about Ad Variations. 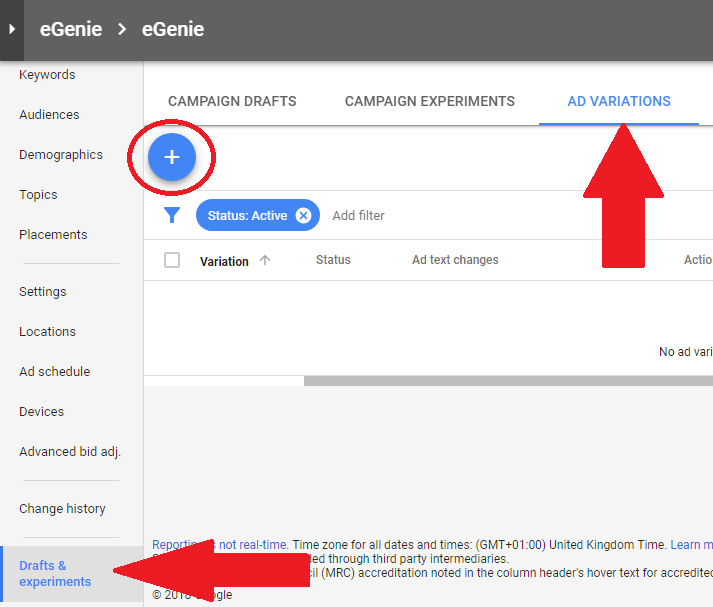 These variations will allow us to test and measure small changes to our Google Ads! Ad Variations are small experiments you can run on any or all of your ads in Google AdWords. This gives you the ability to easily test whether 'Call Us Now!' is a better Call-to-Action than 'Call Now!'. Thankfully it is not possible to run simultaneous experiments on the same ad, but there is nothing to stop you running different experiments one after the other. In fact, you should run different experiments one after the other. As an example, for one of our customers, we recently proved that having the word "Hire" in our Keyword phrase resulted in a higher Click Through Rate. Yes, they are a "Hire" company(! ), but the thing about ads is that often the results are counter-intuitive and you can only find out which is best by testing and measuring. If you want to know what is inside the Black Box - read on! How do I set up an Ad Variation? I'll use the above example of comparing the two slight variations of a common Call-to-Action: 'Call Now!' and 'Call Us Now!'. NOTE: In order to set up Ad Variations, you must be using the new version of Google AdWords. When the Overview Dashboard for your account loads, scroll to the bottom of the menu on the left hand side of the page and click on 'Drafts & Experiments'. Then go to Ad Variations tab and, if you're ready to set up an Ad Variation, click the big blue plus. In the first step of the process, you select which ads you want to run the experiment on. 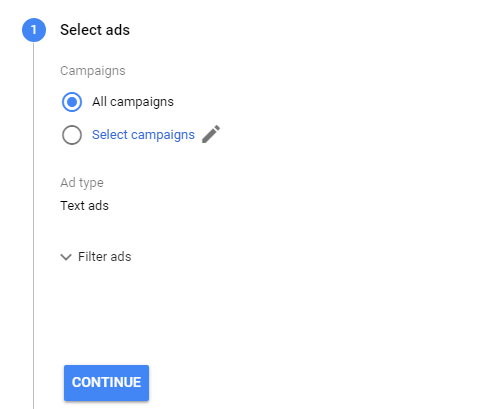 I've selected All Campaigns, but you can refine the ads on which you want to run the experiment by either: choosing specific campaigns (via the Select Campaign option), or putting a filter on your selection. Here you can choose from three different types of variations: Find and replace, Update text, Swap headlines. Find and replace allows you to find text in any part of the ad and replace it with something else (read better!). Update text allows you to update an entire section of your ad (including the Final URL of the ad, so you could even test the effectiveness of one of your landing pages). Swap headlines does what it says on the tin - swaps the first and second part of your headline text. 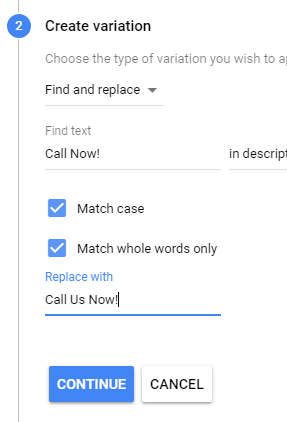 In our example, we will use Find and replace to find 'Call Now!' and update it with 'Call Us Now!'. Note, it's probably a good idea to tick Match case and Match whole words only to avoid any unexpected complications. 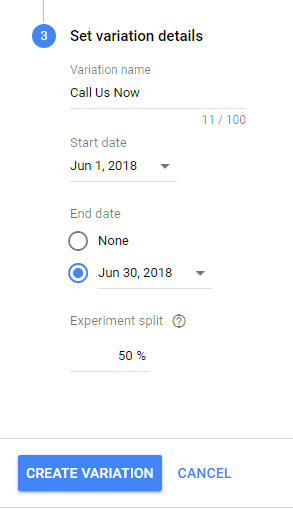 Give your variation a name, choose a time frame and choose the experiment split. Et voila, you're good to go! Press Create Experiment and check back how you're getting on as frequently as you'd like. You've created an experiment! We have started setting up Ad Variations for all of our clients to see how minor changes to our ads can affect their performance. Optimisation is one of the crucial parts of a successful AdWords campaign, and here at eGenie we love to optimise. Find out how we can grant your 3 wishes - get in touch today! Whenever you run an experiment, you must control the variables. One way Google controls variables on your behalf is to only allow one Ad Variation per ad at any one time (see above). 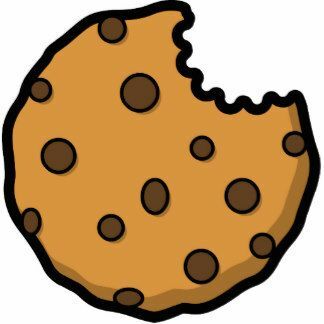 Perhaps more impressive is that Google puts down a cookie on the searcher's browser. This is so Google knows to show them the same version of the ad next time they search for the same thing. Google is essentially trying to help you get reliable (read usable) results from your Ad Variations and doing the hard bit for you!